Beauty is commonly defined as a characteristic present in objects, such as nature, art work, and a human person, that provides a perceptual experience of pleasure, joy, and satisfaction to the observer, through sensory manifestations such as shape, color, and personality. Beauty thus manifested usually conveys some level of harmony amongst components of an object. According to traditional Western thought from the antiquity through the Middle Ages, beauty is a constitutive element of the cosmos associated with order, harmony, and mathematics. Classical Philosophy treated and conceived beauty alongside truth, goodness, love, being, and the divine. In this concept, beauty is a supreme value, basic to the whole cosmos. Modern philosophy shifted the study of beauty from ontology to the sphere of human faculties. Alexander Gottlieb Baumgarten (1714-1762) coined the term "aesthetics," which literally meant a study of human sensibility. With this turn, beauty was dissociated from other ontological components such as truth, goodness, love, being, and the divine. Immanuel Kant (1724-1804) was the first major philosopher who developed the study of beauty as an autonomous discipline. Aesthetics is the philosophical study of beauty, which covers the concept of beauty, its values, and expressions of beauty in artistic creations. The modern view of beauty differs from the classical concept in three ways: 1) It gives greater weight to the contribution of the observing subject to judgments of beauty; 2) it de-emphasizes moral beauty; and 3) it ignores the evident "beauty" of mathematics, along with the unparalleled beauty of nature with its source in the "elegance" of scientific theory. Perhaps the first is a positive development, because what one normally experiences is that the determination of beauty is derived from some kind of interaction between subject and object, and not from the object of beauty alone. Some argue that the second development has impoverished the modern notion of beauty, while the third issue shows the poverty of modern aesthetics when faced with the requirements of the sciences. Beauty has been recognized as a core value throughout history and in diverse cultural traditions. While beauty has cross-historical and cross-cultural recognition, the senses and the standards of beauty differ from one period to another, as well as from one cultural tradition to another. The Greek word kalos ("beautiful") was used in ancient Greek societies, not only for the descriptions of sensibly beautiful things, but also morally admirable character and conduct, noble birth, high social status, and technically useful things. The Greek word kalokagatia ("beauty-good"), combining two terms "beauty" and "good," was a natural combination in the Greek context. Greek philosophy was built upon the presupposition that happiness (eudaimonia) is the highest good. Philosophers differed in their interpretation of what happiness is and the best method for achieving it, but shared the same conviction that it is ultimate goal of life. Accordingly, the Greeks were concerned with understanding beauty, and how beauty can contribute to the highest good. They would investigate beauty in association with truth and goodness, which also pointed to the divine. Thus, the study of beauty was not an autonomous discipline. It was not "aesthetics" in the sense of a "study of human sensibility," which emerged after Kant. Pythagoras and Pythagoreans understood that harmony is an objectively existing principle that constitutes the cosmos as a unified body. Harmony is built upon mathematical order and balance, and beauty exists as the objective principle in beings which maintain harmony, order, and balance. They recognized that aesthetic experiences in arts such as music are closely tied to mathematical ratios of tones and rhythms. The Pythagorean connection between beauty and mathematics remains a touchstone of scientific thought to this day. Pythagoras and the Pythagoreans understood experiences of beauty and contemplations of the mathematical as central to their religious exercises to purify the soul. Aesthetic experiences and exercises of reason were understood as a necessary process and training to cultivate the soul, which they understood to be immortal. They built a theory of beauty within the framework of their religious thought. Their conviction of the immortality of the soul, as well as the relationship between beauty and mathematics, had a strong impact on Plato. Plato (c.428–c.348 B.C.E.) conceived "beauty," "good," "justice," etc. as eternal, immutable, divine existences. They are Ideas—not mental images or psychological objects of mind, but objectively existing, unchanging, permanent, and eternal beings. They belong to a divine realm. For Plato, the idea of beauty exists in a perfect form for eternity in the realm of immortal gods, manifested in imperfect forms on the material plane of humanity. Plato referred to the world of humanity as a "shadow" of the perfect world of ideas. Thus, the basis of earthly beauty was built into Plato’s metaphysics. Human souls are immortal. Every human being is born with implicit understanding of the Idea of beauty and all other Ideas. Upon entering into the body at birth, a human being temporarily "forgets" these Ideas. Throughout her life course, she seeks to familiarize herself with these Ideas. This process is a recollection of Ideas the soul has temporarily forgotten. The process of ascent through the experience of beauty begins with beauty manifested in human bodies. It is gradually elevated to the beauty in the soul, beauty of character, and other incorporeal realms. Beauty manifested in bodies and physical materials is less perfect for Plato, and hence the soul is naturally led to seek permanent and perfect beauty. For Plato, the power of eros is the driving force for the quest of perfect Ideas in humans. Plato conceived the Idea of good as the supreme one, with all other Ideas, including beauty, existing under it. In his ontology, beauty, good, truth, and other virtues are all tied together. Accordingly, "to be beautiful," "to be virtuous," and "to have true knowledge" are inseparable. Plotinus (205-270 C.E. ), who developed the Neo-Platonic tradition, also held that good and beauty are one in the realm of thought, and that the soul must be cultivated to see good and beauty. In both Platonic and Neo-Platonic traditions, concepts of "being," "good," and "beauty" are always understood to be inseparable. The experience of beauty is therefore also inseparable from that of being and good. Unlike Plato, Aristotle (384-322 B.C.E.) conceived beauty not as an immutable, permanent being existing above the world, but as a property of nature and works of art. While tying beauty with the good, Aristotle also made a conceptual distinction between them. Aristotle developed a theory of art and presented it as part in his Poetics, but his ideas and discussions on beauty and art are scattered in diverse works including Metaphysics, Nichomachean Ethics, Physics, and Rhetoric. He focused more on examining existing forms of art and developing art theory. As a Christian thinker, St. Augustine (354-430) ascribed the origin of beauty, good, and being to the Creator God. Beauty, as well as goodness and existence, come from the Creator alone. Augustine maintains the Platonic unity of beauty, goodness, being, perfection, and other virtues. Rational understanding of the order and harmony of the cosmos, and recognition of beauty, were stations on the soul's path of purification and ascent to the divine realm. Thomas Aquinas (c.1225-1274) distinguished beauty and good in terms of meaning (ratio), but he identified them as the same being (subjectum), indistinguishable in reality. Since God is the only source of beauty, good, and being, they are said to be in oneness. He enumerated elements of beauty: Perfection (integritas sive perfectio), harmony (debita proportion sive consonantia), and clarity (claritas). After Christian thought receded from the mainstream of philosophy, the discussion of beauty also shifted from its metaphysical treatment to the studies of the perception of beauty. With and after the flourishing of the arts in the Renaissance, beauty was discussed in relation to human capacities in the arts. In the eighteen century, Alexander Gottlieb Baumgarten coined "aesthetics" for the study of "human sensibility" (aisthesis in Greek). The concept of "sublime" was also discussed in relation to morality. 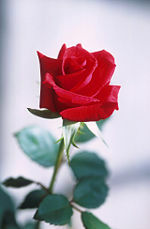 Many see natural beauty folded within petals of a rose. Prior to the publication of the Critique of Pure Reason (1781), his major work on epistemology, Kant wrote Observations on the Feeling of the Beautiful and The Sublime (1764). However, it was by writing the Critique of Judgment (1790) that he established the philosophy of art as an independent genre. The Critique of Pure Reason, the Critique of Practical Reason (1788), and the Critique of Judgment, respectively, discussed the three domains of nature, freedom, and art through the analyses of three faculties of the mind: Cognition, desire, and feeling. The analysis of beauty became one of the major independent branches of philosophy, comparable to epistemology and ethics. This was a departure from both the Classical and Medieval philosophers, for whom beauty and art was not an independent or autonomous field of study. The focus of the study of beauty shifted after Kant from the beauty of nature to the arts. German Romantics, such as Goethe, Schiller, and Hölderlin, and German philosophers, such as Schelling and Hegel, further developed the philosophy of art. Studies of beauty in German Idealism reached a peak with Schelling, while Hegel approached the arts from a historical perspective. After Hegel, studies of beauty were further dissociated from metaphysics, and arts were also separated from the traditional concept of beauty. In the twentieth century, however, metaphysical discussions of beauty were revived by Heidegger and Gadamer. The philosophy of beauty and arts today is one of the important branches of philosophy. Far Eastern thought has three major traditions: Daoism, Confucianism, and Buddhism. These traditions are intertwined, forming a general background within which their experiences and concepts of beauty were formed. Unlike in Western philosophy, the East did not develop an abstract theory of beauty. Beauty was ordinarily discussed within ethical (Confucianism) and cosmological (Daoism) contexts. The Chinese character for beauty (美) consists of the components of "sheep" (羊) and "big" or "great" (大). As Confucius described in Analects, a sheep is an animal used at religious rituals as an offering to Heaven. Beauty thus means "great sacrifice" which connotes "self-sacrifice." Traditional virtues such as filial piety and loyalty involve this self-sacrifice and therefore were considered to be noble and beautiful. Beauty is therefore often ascribed to virtuous actions, good character, and exemplary life style. Thus, beauty in a wife is seen in her fidelity to her husband; beauty in a son in his filial piety towards his parents; and beauty in a subject in his loyalty to the king. By the way, the Chinese characters for good (善) and justice (義) similarly contain the component "sheep" (羊). Beauty was also understood as a part of nature. Nature is the totality of the cosmos, which encompasses human life as well. "To be natural" means "to be authentic." In Daoism in particular, ethics and cosmology fused with naturalism. Beauty was understood as a natural expression of the cosmos and the norm of human behavior. Classical Greeks and Medieval Christians understood beauty to be primarily what exists objectively in the world, tracing it in the divine realm. It is in this context that Thomas Aquinas' celebrated arguments for God's existence "from degrees of perfection" and "from design" can be understood. With the emergence of aesthetics in modern philosophy, however, the role of the subject in perceiving beauty became an important matter. Aesthetics was meant to discuss how an individual's sensuous perception as a subject occurs in judging beauty. Kant discussed aesthetic judgments of beauty in terms of an individual's subjective feelings, although they are not purely subjective, as Kant had them claim universal validity. One reason why Kant wanted to avoid the Greek and Medieval objectivist approach was that he was critical of Thomistic arguments for God's existence. Far more subjectivist than Kant were his contemporaries, such as David Hume (1711-1776) and Edmund Burke (1729-1797), according to whom beauty is subjective in that it largely depends on the attitude of the observer. Baumgarten and G. E. Lessing (1729-1781), by contrast, tended to be objectivists. While it is true that the object does contain physical elements of beauty that are in harmony, it is also true that the object alone cannot determine the value of beauty. The determination of beauty involves the subject as well, who has a certain attitude and pre-understanding. Kant is considered to have mediated between the objectivist and subjectivist positions mentioned above. His Critique of Judgment explains this in terms of the "free play" or "free harmony" between imagination and understanding. This free play constitutes a feeling of "disinterested" pleasure in a non-conceptual, if empirical, state of mind. Although Kant's use of the term "disinterested" may invite some questions, his realization that a judgment of beauty results from both subject and object "is probably the most distinctive aspect of his aesthetic theory." The degree to which subjective influence affects one's view of beauty is relevant to discussions of popular taste in film or music. People's values influence the types and genres of films they watch and music they listen to. The negative reaction of today's adults to the sometimes violent and exploitative lyrics of hip-hop mirrors an earlier generation's alarm about rock and roll music in the 1960s. These subjective influences often involve moral sensibilities, to which we turn next. Rather than individual virtues, Far Eastern thought primarily focuses on relationships in the family and society, such as filial piety (moral beauty shown by a child to its parents), fidelity/chastity (moral beauty from wife towards husband), and loyalty (moral beauty displayed by an individual to a superior). But, these individual virtues and family/group virtues overlap without any gap. Various kinds of moral beauty or goodness seem to be even more important than beauty in nature and art because they lead to the divine realm moreso than natural beauty and beauty in art (Greek and Medieval) or more directly reflect heaven (Far Eastern). According to French philosopher Victor Cousin (1792-1867), who inherited the tradition of ancient Greek philosophy, "Moral beauty is the basis of all true beauty." Is there something about the face and figure of a budding young woman that a man finds beautiful, regardless of culture, time, and place? One can argue that nature designed (through the evolutionary process) the mind of an adult male to respond to the shape and movement of the adult female, with feelings of attraction and beauty. In this sense, beauty has its roots in nature. It is a given, something that culture can modify but never deface. Can the same be said for the music of Bach or the sculptures of Michaelangelo—do they call forth feelings of beauty in all people, regardless of culture, time and place? They can, to the extent that they express the essence of nature and its underlying design. The beauty in a Bach fugue may be rooted in the principles of mathematics. Interestingly, a related discussion takes place in that field, between Realists and Constructivists. Realists, following the classical tradition, see the task of the mathematician to discover patterns and laws that already exist in the fabric of nature, while constructivists see mathematics as a work of human reason and imagination that may transcend the lineaments of reality. What the views of Classical philosophers, Christian thinkers, and Far Eastern thought have in common is an encompassing view of beauty that unites beauty in nature, in art, and moral beauty as one. They are seeking what might be called the absolute standard of beauty, the original beauty of the Creator. ↑ Stanford Encyclopedia of Philosophy, "Kant's Aesthetics and Teleology." Retrieved August 21, 2007. ↑ Giga Quotes, "Victor Cousin". Retrieved August 22. Feagin, Susan L., and Patrick Maynard. Aesthetics . Oxford University Press, 1998. Hofstadter, Albert, and Richard Kuhns. Philosophies of Art & Beauty. The University of Chicago Press, 1964. Navone, John. Enjoying God's Beauty. The Liturgical Press, 2003. This page was last modified on 25 May 2016, at 14:13.